Free online webpage to pdf conversion and saver tools enables us to save a webpage as a pdf file to our computer just by copying and pasting the URL of the webpage you want to save as a pdf file. These tools prevent us from installing an extension on our browser. Other people may suggest you to install an extension for this purpose but why you’re wasting time to install these heavy extensions? Note that it also a cause to make your web-browser slows down. If you want to make your browser works fine, fast and don’t want to waste your time & space installing extensions, I suggest you to use these web-applications which will do your work without installing a tiny thing! Sometimes you may need to save a webpage as a pdf file due to some reasons. Suppose you want to read an article from a webpage later. Or let suppose you want to send this webpage to a friend to read it. So in that cases it is a good idea to save a webpage as a pdf file on your computer. Also you may want them to edit in word processor free software as you wish. In our recent post, we discussed that how to save a webpage as a pdf in google chrome, because google chrome has a built-in feature of saving a webpage as a pdf file. But what if you have any other web-browser as your default browser? Because other browsers don’t allow you to save a webpage as a pdf file, but don’t worry in this post we are here to give you a list of free online web to pdf conversion tools which can be accessed and used from any web-browser. this is one of the powerful and great tool, I am using this one itself. Converting a webpage to pdf is very easy with this tool and is worth visiting this LINK and pasting the URL of the webpage which you want to save as a pdf file. After you pasted the URL in the text box, you have to click on convert to pdf button present at the front of this box. Also it gives some more advanced options but to get access & apply these you will need to register yourself with this tool. If you want to download a webpage as a pdf file just by entering the URL of that page then pdfmyurl is here to the that job for you. Here what you have to do is to simply paste the url of the page you want to convert to pdf and hit enter button so an automatic download will start. You can make use of this website to save a webpage to the pdf file, so you will be able to read it in later time or send it to a friend in case if you are saving it for giving it to others. 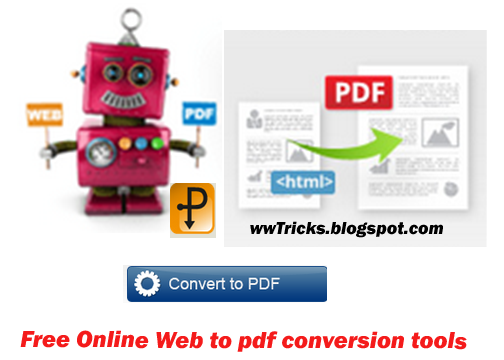 One of the best trick using this website for pdf conversion is that it loads very fast and converts your webpage very fast as compared to other tools. In order to convert and save a webpage as a pdf file, you’ve to paste the website Url and paste into the box, provided and then click on the red “Convert” button just below this box. After clicking on that button, a short process starts and a little box appears with the name “Download the result” so click on that to start the downloading of the converted file. This is one other free online tool and web-app which enable you to convert a webpage to pdf file. In order to convert a webpage making use of this tool, you just need to copy the page url to your clipboard and then paste it into the box provided in htmlpdf’s website and then click on “Get PDF” button present just below that box. There are also some other tools and recommendations that will convert and save a webpage to pdf online such that, web2pdf, pdfburger, pdfaid, and pdfspot etc. So friends, above we shared some free onine webpage to pdf conversion tools, i hope these tools will help you in time you want to save a webpage as a pdf file format. Also do share this post with others.